Join us for a welcome cocktail and light snack at the Danubius Hotel on the stunning Margaret Island! Have a chance to register early for the conference, collect your programme and meet the conference team as we all gather in the lovely conference venue. This event is open to all conference delegates and included in your conference fee. The Borkatakomba (Wine Catacomb) Restaurant was established in a former wine cellar extending to several branches of the Budafok cellar system, it is the restaurant with the richest traditions. Borkatacomba is more than a restaurant: on one hand a restaurant, on the other hand a theatre. 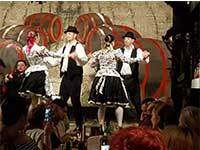 Folk danse ensembles deliver performances specially choreographed for the Borkatakomba, in the accompainement of Jozsef Balazs's 5-member orchestra in the centre of the restaurant called Theatre Hall. Join us for a fun evening of incredible food and entertainment and awards.